Colorado River Update: Every Dam Project Has Been Stalled — We Need Your Help To Keep It That Way! In 2017, we filed the first lawsuit in federal district court in Denver to stop the first new dam/diversion on the Colorado River in 30 years. Your support helped us do that, and we are poised to challenge even more proposed new dams in 2018/19! Our Policy is “No New Dams And Diversions”, and in 2017/18 we stood directly in the path of every single proposed dam and diversion project including in federal district court, in the court of public opinion, and in the media. About a dozen new dams/diversions/pipelines are proposed on the Colorado River and its tributaries in the Upper Basin States – Colorado, Wyoming, and Utah – and Save The Colorado is leading, or helping to lead, the fight to stop every single one of them. 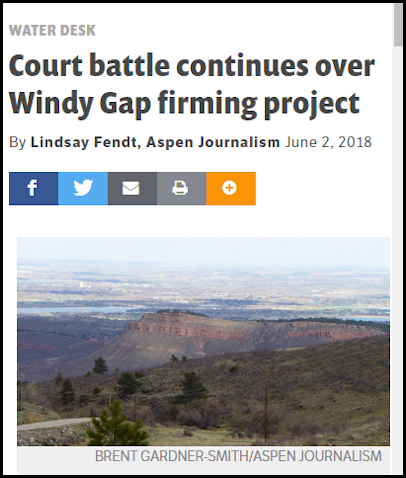 Filed a lawsuit in federal district court in Colorado against the U.S. Army Corps of Engineers and the U.S. Bureau of Reclamation to stop the Windy Gap Firming Project. Created and sent the Army Corps of Engineers and Federal Energy Regulatory Commission dozens of pages of new scientific, legal, and technical documents that challenge the Moffat Collection System Project to set Save The Colorado up to fight in 2018. Engaged in the permitting process of several other projects and put the agencies on notice that formidable opposition is preparing to fight them. Generated thousands of emails from constituents to these agencies and decision-makers. Generated over 20 news articles about the threat of these projects and the continuing demise of the ecological health of the Colorado River. Initiated or joined multiple coalitions of environmental groups to fight each project. Hired a team of consultants and attorneys to help with fundraising, technical analysis, and litigation. As a result, every project has been stalled, and we put the dam builders on notice! The Moffat Collection System Project received a permit from the Army Corps in the summer of 2017, and in the next few months will receive its license from the Federal Energy Regulatory Commission. 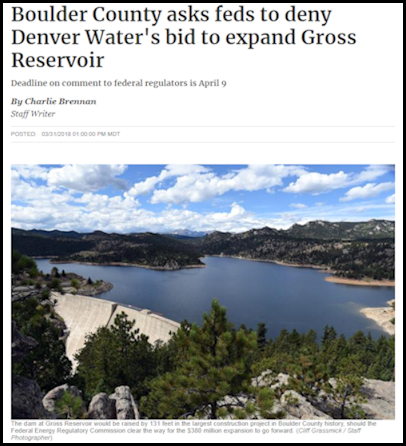 The Project – proposed by Denver Water – would drain a new 15,000 acre feet of water out of the Colorado River’s headwaters and build the tallest dam in the history of Colorado in Boulder County, Colorado. Save The Colorado has put together a coalition and is leading the effort to fight to stop this project. Save The Colorado has also helped create a broad outreach campaign to the Boulder County Commissioners asking the Commissioners to help stop the project and protect Boulder County’s environment. The Lake Powell Pipeline initiated its permitting process with the Federal Energy Regulatory Commission (FERC) in December 2015. The Project – proposed by the State of Utah – would drain a new 86,000 acre feet of water out of the Colorado River. We have signed on to, and are working with, a coalition of Utah-based groups to address this threat, including legally intervening in the permitting process, providing comments to FERC, and helping to lead national and basin-wide public and media outreach in the campaign to fight the project. The Fontenelle Dam Re-engineering project may initiate its federal permitting process with the Bureau of Reclamation in 2018/19. The Project – proposed by the State of Wyoming – would drain a new 125,000 acre feet of water out of the Green River before it flows into the Colorado River. 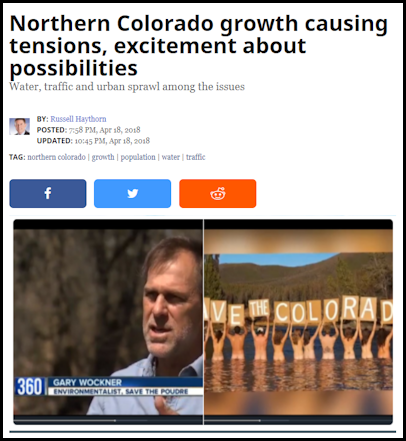 Save The Colorado has led the effort to reach out to the public, media, and decision-makers (including the Bureau of Reclamation) to address this threat. We will continue our outreach and advocacy campaign to fight this project, and if the permitting process is initiated, we will engage in the battle to stop it. The Wolf Creek Dam, proposed beside the White River in Rio Blanco County, Colorado, is hoping to begin its permitting process in the next year. The project proposes to divert hundreds of thousands of acre feet of water out of the White River each year, and store it in a massive reservoir, further depleting the White River and the Green River downstream. The proposed West Fork Dam in Wyoming on the Little Snake River, a tributary of the Yampa River, received funding from the State of Wyoming to move forward in 2018. We fought it in the media and will fight it through the planning and permitting process as that continues. In every one of these projects, we are promoting sound science, common sense solutions, and alternatives that focus on a new river-management paradigm in our increasingly climate-changed world. We must use less water (by increasing water conservation in cities and farms), waste and evaporate less water (by storing water in Lake Mead rather than Lake Powell, as well as other solutions), and restore water to the dry Colorado River Delta. In 2017/8, we put the dam builders and river destroyers on notice! In 2018/19, we will continue the work. Save The Colorado will continue to be the most vocal river-advocacy voice in the Colorado River basin with outreach efforts to the media, decision-makers, and a large social media campaign with the public. Challenging these five river-destroying dam/diversion/reservoir projects through outreach and litigation is the goal of our work for the next year. We will also continue to monitor and comment on all of the proposed river-destroying projects throughout the Colorado River basin and engage against them as the opportunity arises. Colorado River Update! Help Us Stop The Tallest Dam In Colorado In 50 Years!